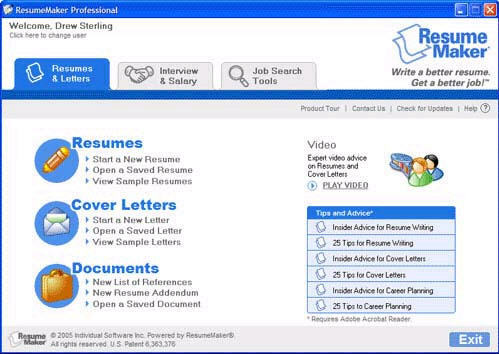 ResumeMaker Professional Ultimate is the first ever commercially available, complete job search program that's designed to ensure you'll land a job you can enjoy. It's the only software that's designed by certified, professional career counselors with breakthrough technology to help you in every aspect of your career. you can search Jobs and Careers, ResumeMaker have the most Powerful Job Search Tools Available Anywhere. available, complete job search program ensure you'll land a job. ...... Save time with thousands of recommended phrases, hundreds of real-world examples, dozens of professional styles, and Insider Advice you won't find anywhere else. Ace the Interview and Negotiate a Higher Salary! A great resume only gets you in the door. It's your interviewing skills that get you the job you want. Whether you are preparing for an interview, launching a job search, or just want to negotiate a better salary, you'll have all the tools you need. A professional yet easy-to-use Windows tweaking utility. Qweas is providing links to ResumeMaker Professional Ultimate 5.0 as a courtesy, and makes no representations regarding ResumeMaker Professional Ultimate or any other applications or any information related thereto. Any questions, complaints or claims regarding this application ResumeMaker Professional Ultimate 5.0 must be directed to the appropriate software vendor. You may click the publisher link of ResumeMaker Professional Ultimate on the top of this page to get more details about the vendor.